International Women’s Day is celebrated on the March 8th every year. The day celebrates social, cultural, economical and political achievements of women, while pushing for gender parity around the world. Women represent roughly 50% of our population. The latest report from the International Labour Office showed the global labour force rate for women is roughly 50% versus over 75% for men. The participation gap between the two sexes has worsened gradually over the last 20 years. In sub-Saharan Africa the number of women in employment is higher (~65%), however this often reflects local poverty and a lack of social protection; meaning working for both genders is a necessity. Challenges Worldwide, an award-winning company who work with SMEs in sub-Saharan Africa, help tackle poverty through catalysing socio-economic growth. Challenges also work in line with the United Nations Sustainable Development Goals – one of which being gender equality. 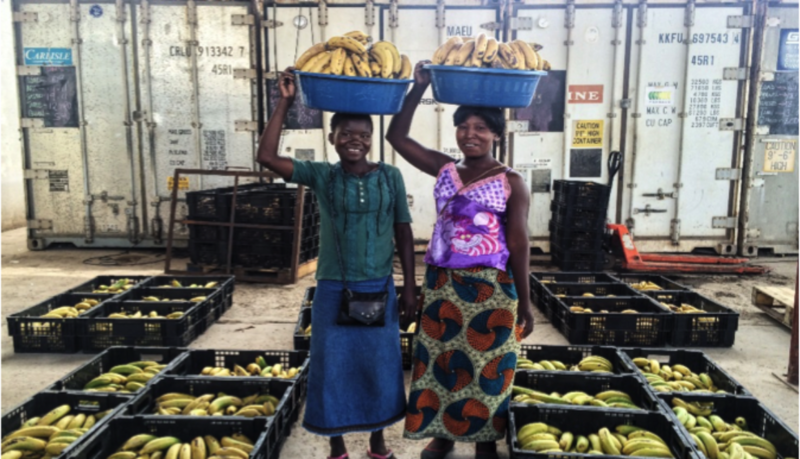 Across Ghana, Uganda and Rawanda, Challenges are working with many female business owners. On the 10th March 2018, Challenges are hosting the WomENtrepreneur Conference in Ghana. Second of its kind, the event is aimed at empowering entrepreneurs and features a strong female line-up of keynote guest speakers. Challenges Worldwide in Uganda has recently celebrated 3 inspirational female CEOs, Mago Hasfa (Smart Toto), Bhavya Kalsi (Kona) and Maxima Nsimenta (Livara) and explored their views, challenges faced and impact on female empowerment. These women are challenging gender inequalities not only by employing women but empowering them to work in senior roles that would normally be dominated by men in the field. The struggle is constant – firstly getting equal education opportunities and challenging the gender role assumptions, but then also in ensuring that women who do gain employment are encouraged and supported throughout their careers. Stay tuned on our website and social media sites for the soon to be released articles and learn how these women, along with Challenges Worldwide, are tackling these issues. This year’s theme for International Women’s Day is Press For Progress – a movement calling for gender parity by motivating and uniting people to think, act and be gender inclusive. What will you do to celebrate this day? Want to get involved with Challenges?  Click here and see what you can do! Challenge yourself to change the world. Planning a successful and impactful trip for your summer/gap year is not always easy given the number of voluntourism opportunities out there. You may have seen the stories that more and more young people are travelling abroad to volunteer so that they can fill up their Instagram account with selfies, or the report from Save the Children that states that “an overwhelming majority of children living in orphanages in developing countries actually have a living parent”. Even J.K Rowling, author of the Harry Potter books, is campaigning against irresponsible volunteering placements, tweeting “I will never retweet appeals that treat poor children as opportunities to enhance Westerners’ CVs”. So, how can you steer clear of the minefield of irresponsible and purely commercial options out there? Be sure to look at “development impact”. Does the charity appear to monitor and report on the impact that their volunteers are having in the community? This could form the basis of an impact page on their website or an annual report. If they don’t seem to have a monitoring and evaluation function in their organisation then chances are they care little about the impact they are having and simply want money from their volunteers. Find out how the programme is funded? 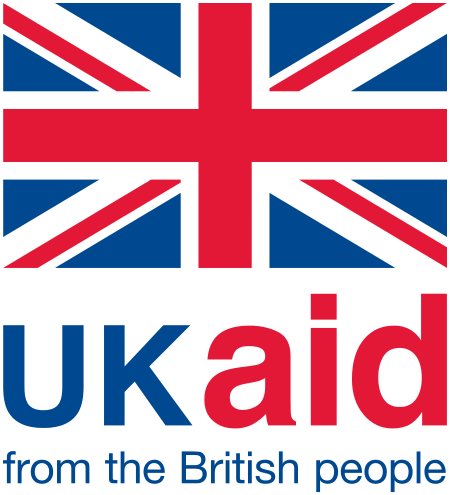 The existence of a recognised funder, such as a development body like UKaid (UK Department for International Development) or SDI (Scottish Development International) shows that a larger body has a vested interest in the programme and the social impact it has pledged to create. Being expected to pay something towards the cost of the programme via fundraising is usually okay as long as the main purpose of the fundraising effort is to raise awareness of the programme and its aims. Is there a tangible benefit to taking part in the programme? Will you be supported to overcome new challenges? 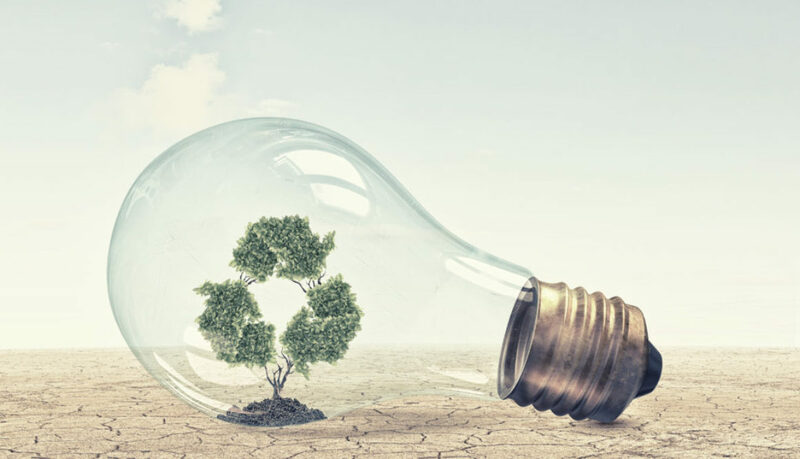 Is there room for personal and professional growth alongside delivering genuine social, economic or environmental impact? Organisations that run a programme that encourages personal growth will tell you about what previous volunteers have accomplished and what skills they have developed, they may even offer a recognised qualification. 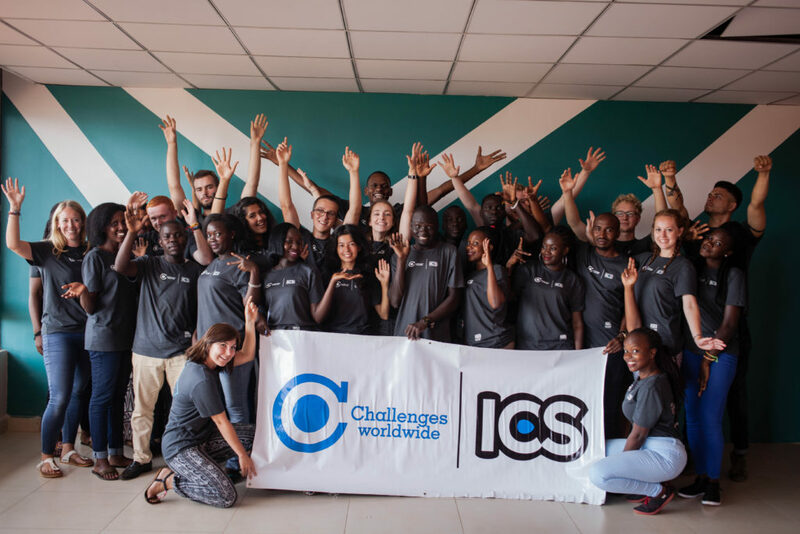 International Citizen Service (ICS) is an overseas volunteering programme for 18-25 year olds, it is funded by the UK Government and aims to bring about three things: project impact, volunteer personal development and the creation of active citizens. There are eight different development organisations delivering ICS projects in over 20 countries. 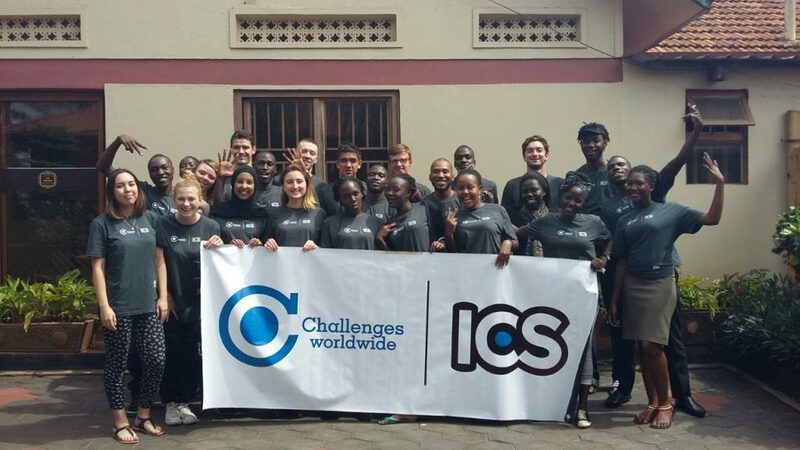 Challenges Worldwide, an Edinburgh based International Development charity, runs an ICS programme to support businesses in Ghana, Uganda and Rwanda. The programme includes 10 weeks of training in Professional Consulting paired with a business placement in one of 4 African cities. The programme is split into three stages: Analysis, Recommendations and Implementation. 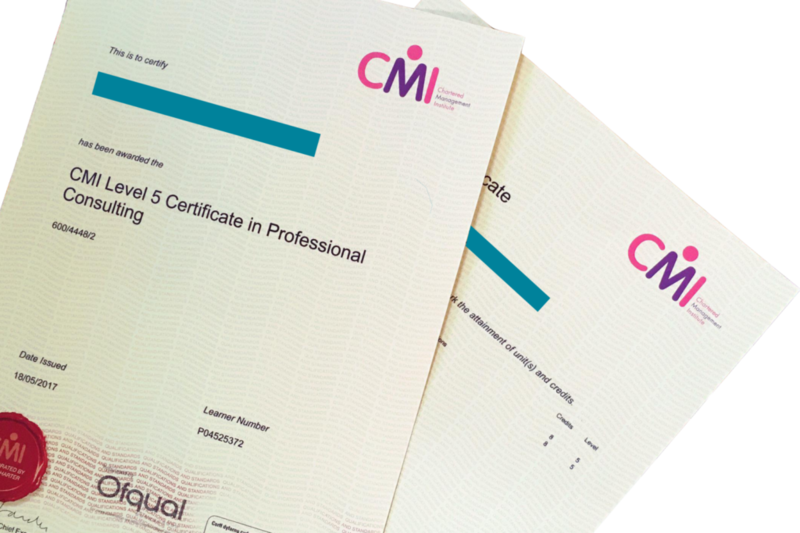 After your placement, Challenges Worldwide will continue to support the growth of the business and you will return home with a chance to complete a level 5 qualification in Professional Consulting with the Chartered Management Institute (CMI). Until the age of approximately 18, I thought that pineapples grew on trees. To be honest, I never really gave them much thought beyond opening a tin of pineapple or eating it with cheese on sticks at a birthday party. Luckily, Beckie reassures me that the pineapple tree misconception is quite common. 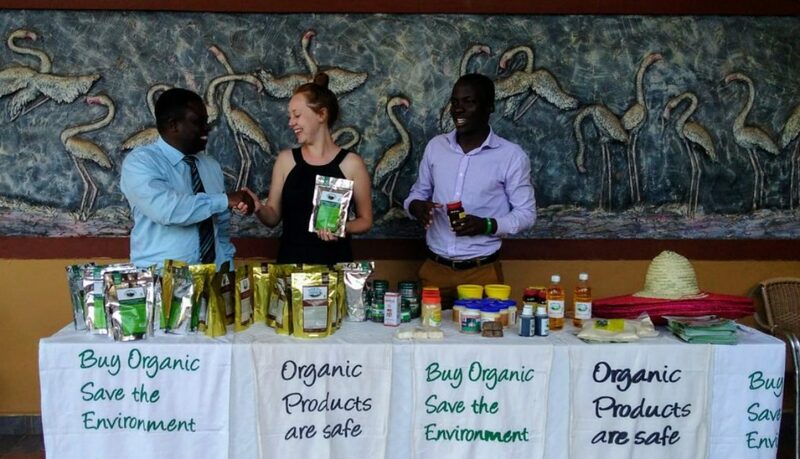 Beckie works for the National Organic Agricultural Movement of Uganda (NOGAMU), the organisation that my business counterpart Richard and I are working with for our Challenges Worldwide placement in Kampala, Uganda. I admitted this ignorance on my part while we were sat under a gazebo, folding hundreds of leaflets for the “Productivity and Growth in Organic Value Chains” conference. If there was one place to improve my knowledge of pineapple, then this was it. However, over the two-day event, I soon learned that this was about so much more than a tropical fruit. 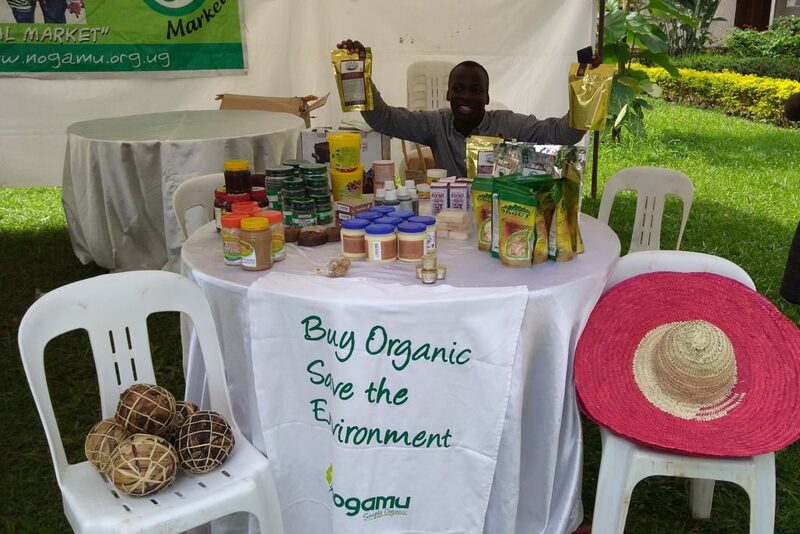 This event was a real landmark for the organic sector in Uganda, a sector that many of Challenges Worldwide’s chosen SMEs are working in. For this conference was a dissemination of the very first research papers produced in Uganda that focused solely on organic agriculture, and all the key players in the movement were there. Thursday saw us meet with a wide range of students and lecturers as we manned the NOGAMU stall at Makerere University (or the Cambridge of Uganda, as Richard told me!) We handled tricky questions about where our products came from, how we knew the farmers weren’t spraying pesticides and tried our very best to convince passers-by to part with their money for an organic coffee soap. 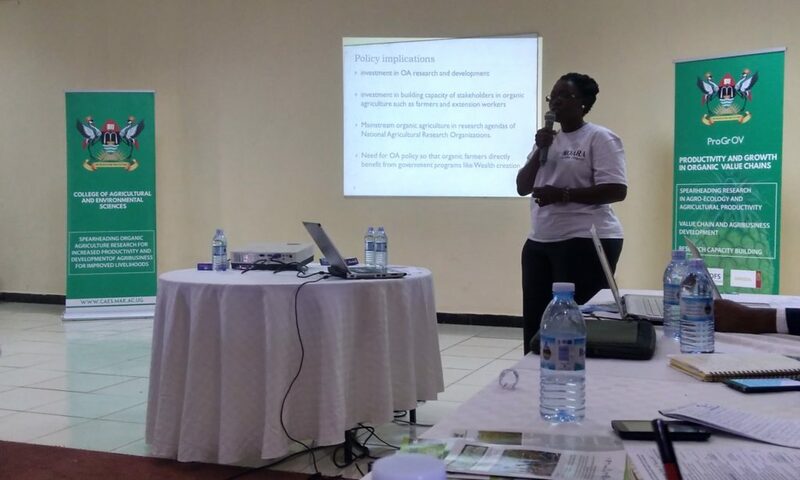 On Friday, we attended a workshop that covered a range of practical tips for organic farmers – pest control, producing silage for cattle – but there was also much discussion on the challenges facing the organic sector in Uganda, which has to date relied heavily on the private sector, with limited government support. It was a privilege to attend an event with representatives from governments and universities both near and far – there was the Vice-Chancellor from a Nigerian university, a representative for the Danish Ambassador and a minister from the Ugandan Ministry of Agriculture, Animal Industry and Fisheries. Attending a Ugandan conference was an experience in itself – plenty of passionate disagreements, running three hours behind schedule and no soggy sandwiches for lunch – but overall one message came loud and clear. This group of people are passionate about their country, its produce and creating a strong agricultural economy through means that are sympathetic to the land and the people. There’s a momentum building and, if we can help assist a little on placement, I’m certainly pleased to be part of it. When I get home and head to Sainsbury’s or Tesco to pick up food, I’ll see those organic pineapples and think of my friends back in Uganda and their vision for sustainable development. And I’ll know for sure that pineapples grow firmly in the ground (in rows of two, surrounded by banana trees for best results, if you’re interested)! During our Challenges Worldwide ICS placement, all volunteers are involved in one of three committees. Working in our committee team is an opportunity to work with a different group of volunteers outside of our day to day work in our businesses. The impact committee organises events to engage more with the wider community. The team building committee organises fun, relaxing and cultural activities for the volunteers. 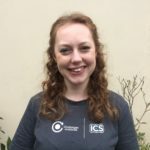 I am a member of the communications committee which gathers and produces content to showcase the team’s experience throughout our ICS placement. My host home counterpart, Mzeziti, is also on the communication committee. 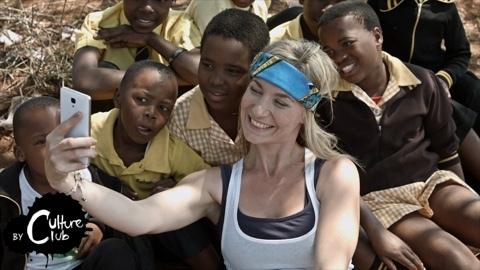 She is passionate about raising awareness of Challenges Worldwide’s work in Zambia through radio and TV. She asked Precious, a Zambian team leader, for her contacts in local radio. Through one of these contacts, we secured a 1 hour Saturday morning slot on Pan African Radio! With less than two days’ notice, we got to work with preparing for our first radio interview, with the support of Team Leader Ari and the Challenges staff in Lusaka. The audience of Pan African Radio’s Saturday morning show is the business community in Zambia. 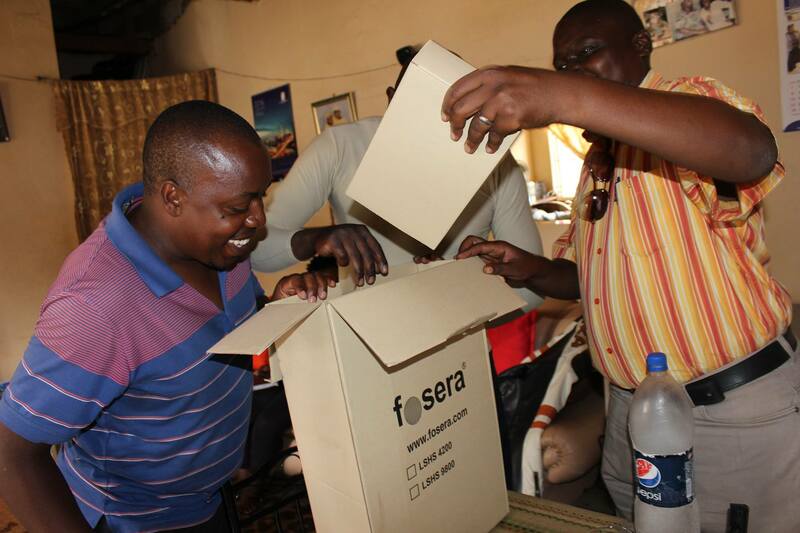 We were excited the share Challenges’ work with local small to medium enterprises (SMEs). Challenges’ have given business support to 105 local businesses so far in their work to support Zambia’s economic growth. The radio host was particularly interested in our experience of volunteering in Zambia and the training we receive. 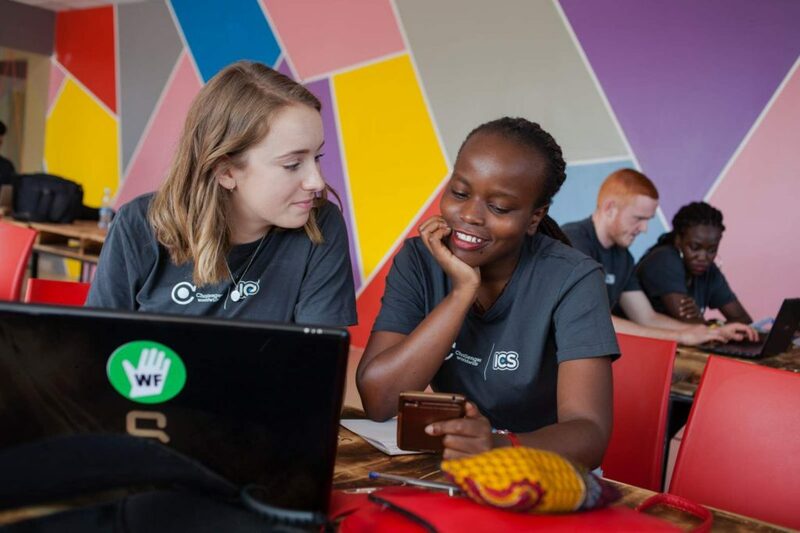 It was a fantastic opportunity to promote Challenges to Zambians who may get involved in the future, either as a volunteer, enterprise or host home! 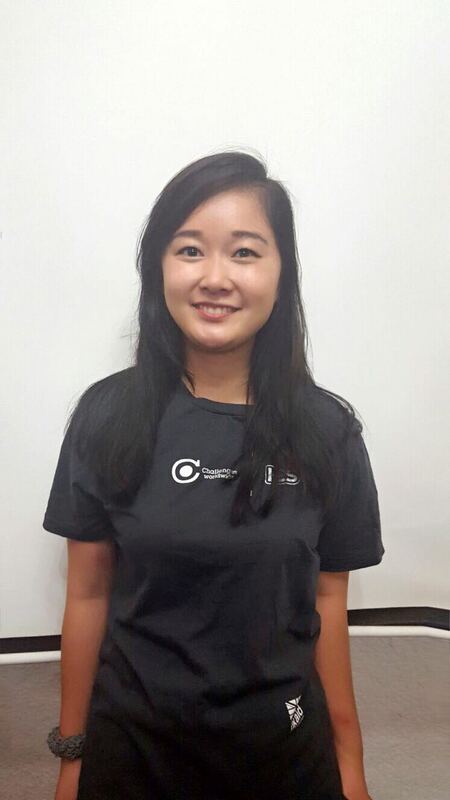 Through my involvement with the committee, I have already developed my verbal communication and teamwork skills. I have had experience in delegating tasks and chairing our team meetings. My work on the Challenges Worldwide ICS communications committee has given me the valuable opportunity to contribute to different aspects of the ICS experience. I never thought that I would have the opportunity to speak live on Pan African Radio!! Empower women, change the world! Inequalities exist all around the world and gender isn’t an exception to this reality. Women represent half the world’s population and yet account for 70% of the world’s poor. To make matters worse, women contribute approximately 70% of working hours in the world but only earn 10% of the world’s income. Hence, women in many countries face inequalities throughout their whole lives, from when they are born until the time they die. From an early age, millions of women face gender-based stereotypes that discriminate them from having access to education. As well as not having access to education often young women are conditioned to see their only aspiration in life is to get married and have children. In the eyes of many societies around the world, having a well-kept home, a happy husband and producing offspring is the only worthy indicator of a successful woman. Those who are able to overcome the first hurdle of accessing an education then grow up to face limited job or promotion opportunities. Often the job opportunities that are afforded are limited to domestic activities and service roles. Many women find themselves with little or no power to make decisions in their work and home and many others have to defend themselves from sexual harassment and gender-based violence, from which millions of women die every year. In Africa, these realities occur every day and, although this has been recognised as a problem to be solved by most African governments, the transition has been much slower here than in other regions of the world. 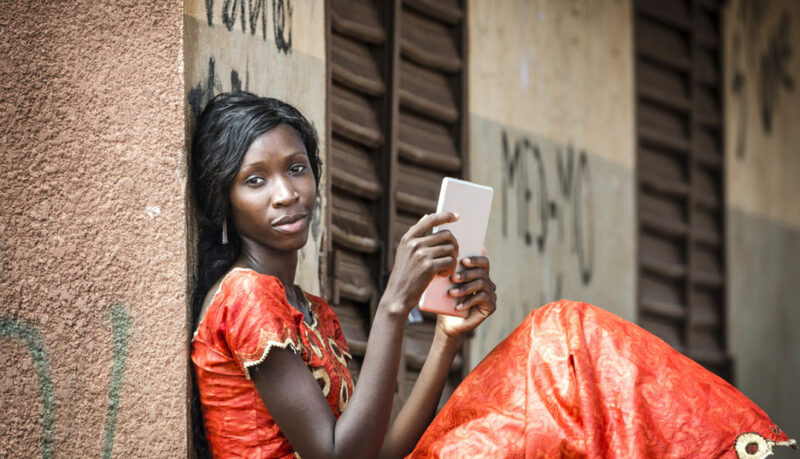 However, empowering women and girls is a key factor for economic development. Healthy and educated girls, with an equal access to opportunities, can help their families to get out of poverty, become leaders in their communities and make significant changes, like Wangari Maathai or Kaya Thomas have done. What can we do to empower women to change the world? The first step is to be informed; running away from the information won’t make gender injustice around the world less of a reality. As Minna Salami says, “it takes individual consciousness to create collective awareness”. “it takes individual consciousness to create collective awareness”. F.R.E.E. is a social enterprise that works to reverse marginalisation of women in Zambia by providing them with opportunities that go from making jewellery to reducing illiteracy levels. 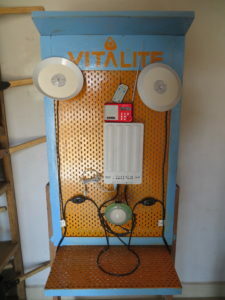 It helps women, mainly single mothers and those who are in a vulnerable situation, to have a dignified source of income. Ng’ombe Jewellery Project, for example, is one of their projects and is based in the Ng’ombe community. 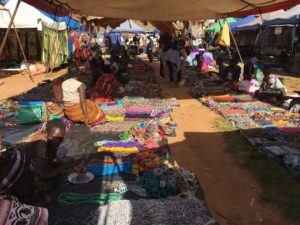 The idea is to teach woman how to make jewellery, from bracelets to necklaces, by using recycled cooper (which have generated many political, economic and social issues in the country), as well as semi-precious Zambian stones. As the cherry on top, each of these pieces is packed in a small chitenge bag, which are sewn by Vida and her sisters, who are disabled but talented women in the Ng’ombe community. Is a skin care business that doesn’t only sell beauty products but builds opportunities for women in Ghana. In this sense, Ele Agbe is empowering women in rural areas to gain a sustainable livelihood by producing quality products for both the local and international market. 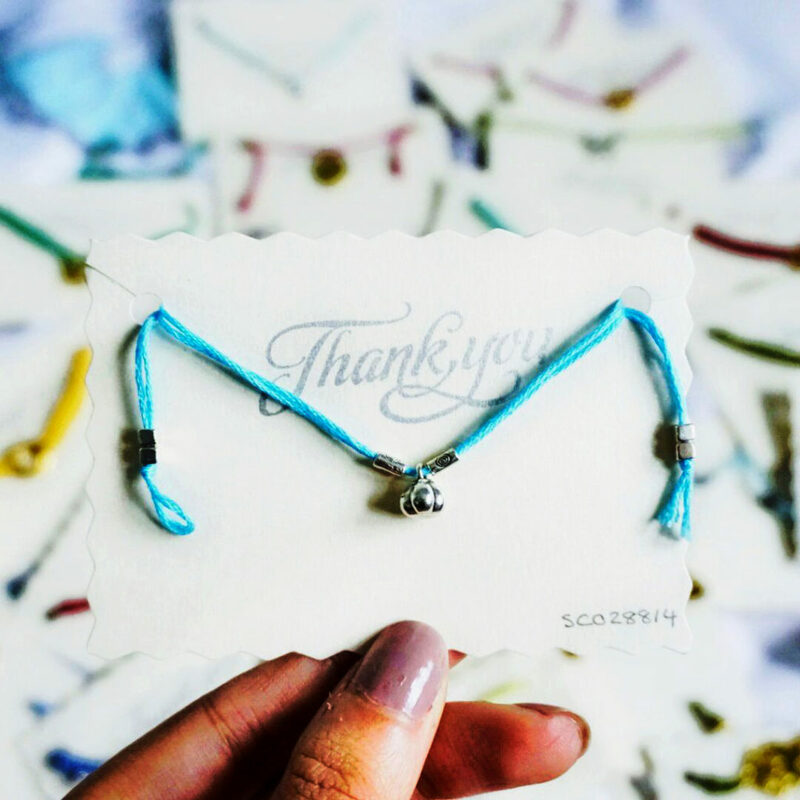 This venture started making jewellery from recycled glass and then moved to shea butter products, thanks to the vision of their inspirational founder and CEO Comfort Adjahoe. But why attempt to tell the story if Comfort can do it better. 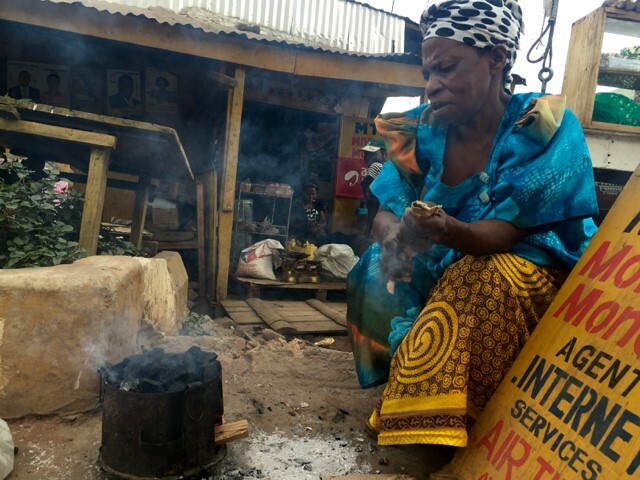 At the end of 2016, Challenges helped El Agbe to link with UK based cosmetics startup Poa Poa who are now distributing El Agbe Shea Butter in the UK. 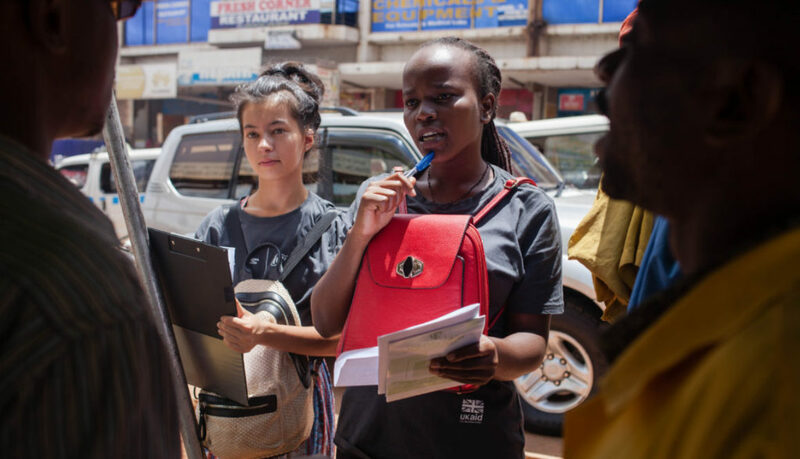 Another women-led enterprise based in Uganda that, contrary to the previous ones, isn’t mainly focused on empowering women but on creating jobs for young people. Decent work opportunities, not charity, as we’ve seen through all these examples, is a more powerful way to provide employment and dignified ways of income. Kampala Fair began with sewing lessons in Mette Islandi, who then teamed up with Louise Graymore from the UK and created Kampala Fair together. Nowadays, Kampala Fair is a sustainable, profitable and fair trade business that sell their products for local and international markets. Everything in this clothing business is locally made, from the vibrant fabrics to the designers and tailors. We invite you to visit the web page, learn more from them and get lost among the beautiful designs. The most interesting thing for me was to witness the similarities between the women here in Kumasi and those I’ve met back home in London during similar tech career workshops. The Kumasi women had the same fears and concerns about interviews and our feedback session focused largely on the same issues with self-confidence and belief in their own awesomeness. Read Rosie’s blog about the evening. Here the gender inequalities aren’t as big as in other countries, however, we aren’t absent of this reality. One of the main issues is the “missing middle” in organisations. What does this mean? Even though at junior management levels both genders are equally represented, male managers are 40% more likely to be promoted to higher roles. This is the number one cause of the 23% gender pay gap. This reality can be changed, but we all need to get involved. Learn more about the #missingmiddle campaign being run by the Chartered Management Institute and take action. You can always be part of bigger changes! You can join Challenges Worldwide by taking part of the International Citizen Service volunteer programme and help any of these enterprises to keep on empowering women or you can do your own bit to fill in the missing middle and join the Chartered Management Institute at an exclusive discounted rate for Challenges learners. By joining many small efforts, challenges can be overcome and great changes can be achieved. Be part of this movement! Take the chance and travel to Africa with us. Apply now! 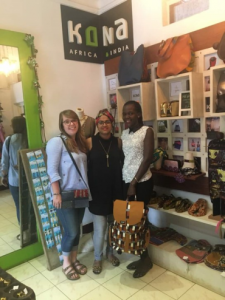 In light of London and Paris Fashion Weeks, Challenges have been celebrating the fashion enterprises we have supported across Sub-Saharan Africa and the innovation of our volunteers in this sector. African fashion and textile businesses are important! A history of imitation brands within the Sub-Saharan African fashion industry, particularly in Zambia, has resulted in a gap in the market for local fashion talent and designers. Across the Sub-Saharan region, international aid has created patterns of dependency, and the provision of clothes from international donations has stunted the development of locally manufactured goods. As part of plans to tackle the dependency cycle in Zambia, laws have been introduced to prevent the importation of textiles, encouraging instead the expansion of the local industry. As more young enterprises enter the African fashion industry and increase their outreach to a global audience, the added competition will drive new brands and local fashion talent. Dressmaking skills are in high demand and are an easy way of making a profit. Reaching into the global market could stop the pattern of imitation and boost the local economy. At Challenges Worldwide, we recognise that sustainable economic growth needs to be achieved through the support of local products, and have been working with African fashion enterprises across Ghana, Uganda, Zambia and Rwanda. 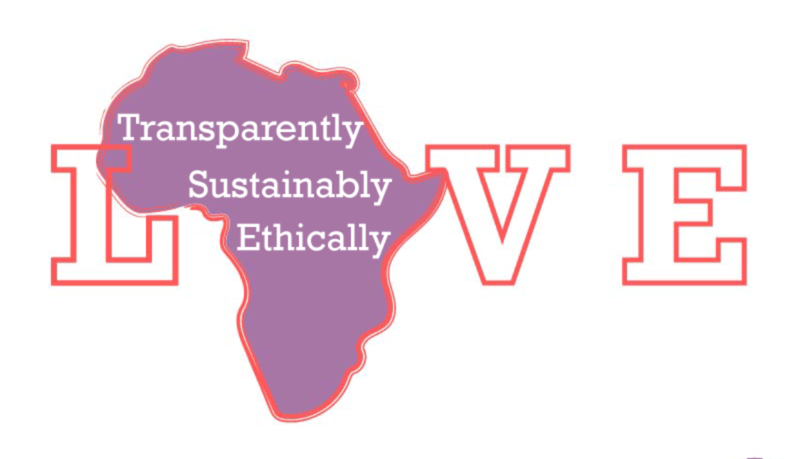 Read more about the role fashion businesses can play within International Development. 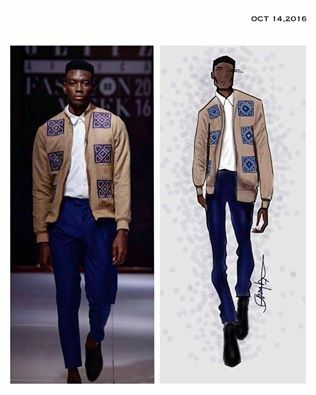 Atto Tetteh is a Ghana-based fashion company revolutionising the African menswear scene. The founder and Creative Director of the company, George Tetteh, aims to compete in the global menswear market with their high-quality clothing designs that have been inspired by local African culture. 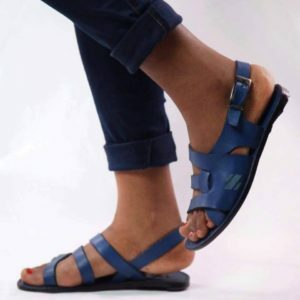 Liberty Powers Footwear is a Ghanaian company, specialising in the production of hand-made leather shoes, and dedicated to increasing specialist skills for young people. 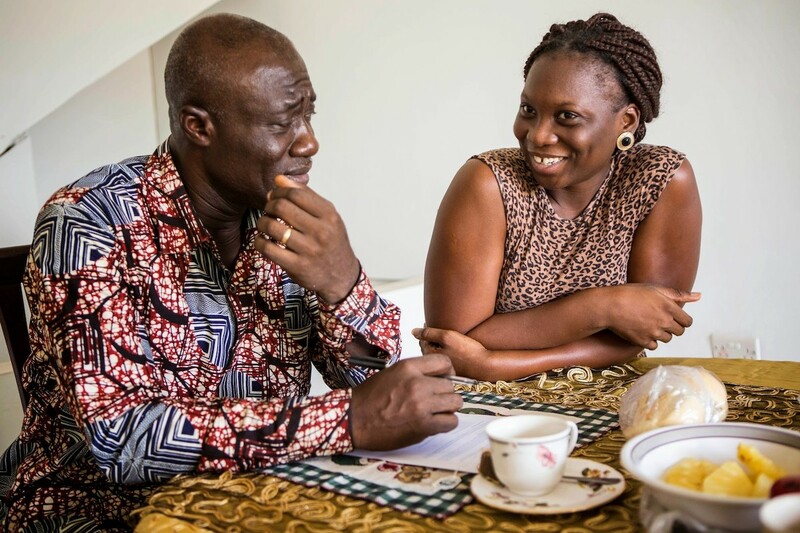 Amos Osomi, the business owner of Liberty Powers, has created an apprenticeship scheme to train local youth in shoe production to increase their employment opportunities. 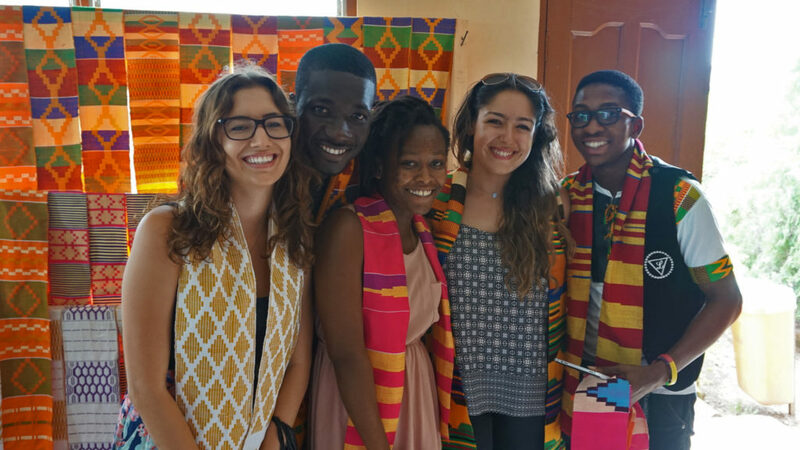 Kente Master is a fabric artisan company committed to promoting African culture, entrepreneurship, and economic self-empowerment. We do this by servicing and providing a unique inventory of premium Kente graduation stoles. With Kente Master, you’ll receive authenticity, customizability and choice that can’t be found anywhere else. Buqisi-Ruux, meaning ‘Queen of the Village’, is a women’s footwear enterprise based in Kampala, Uganda. 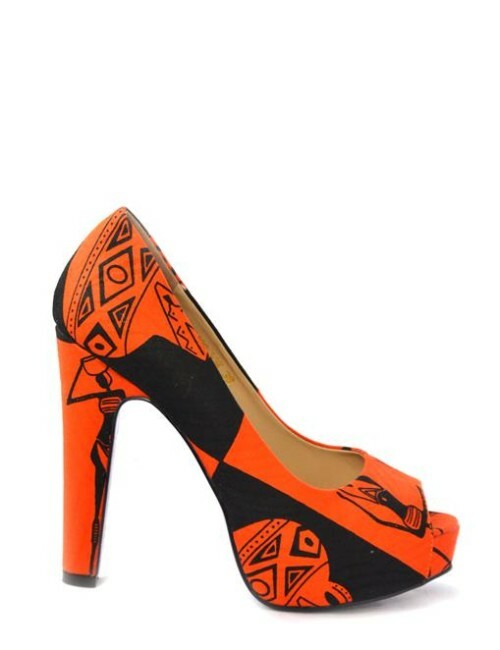 The company, founded and run by women, consider their African inspired shoe designs as “wearable art”, and aim to promote African culture and women’s empowerment through their work. The Foundation for the Realization of Economic Empowerment (FREE) is an artisan business established to provide economic empowerment to women and to tackle gender inequality. 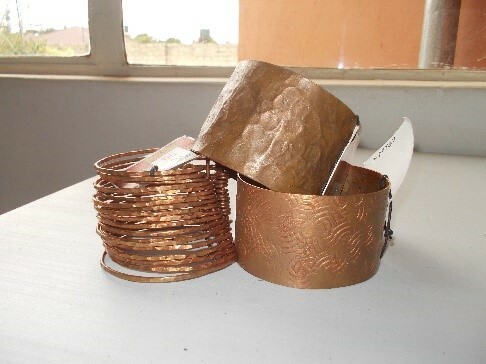 The enterprise works with young women living in poverty, training them with artisan skills, such as copper jewellery production. 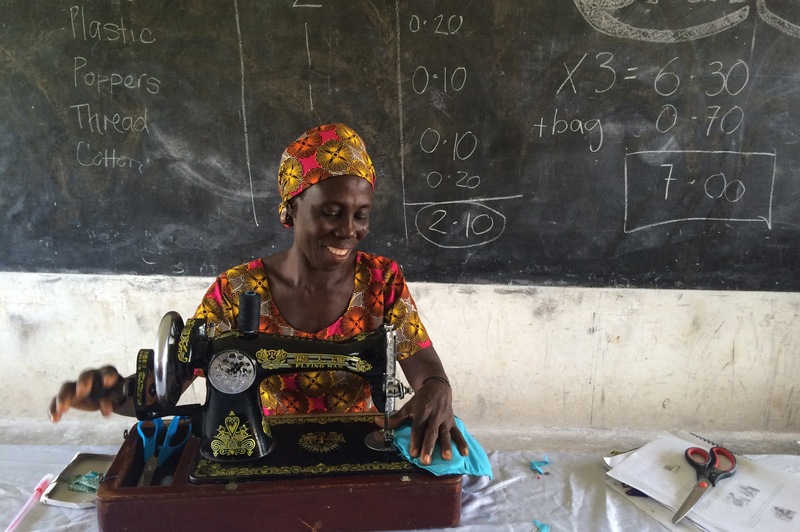 Providing young women with a skill can help them gain the financial independence to better their own lives. 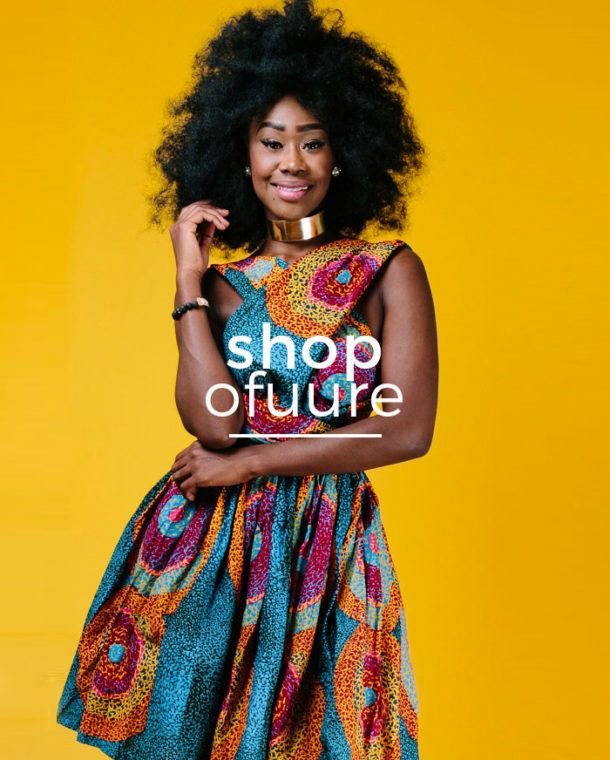 ZUVAA – A U.S based digital marketplace for African inspired fashion. The Zuvaa Marketplace is a premier online destination to find unique and one of kind African Inspired pieces. Zuvaa works directly with emerging designers around the world to bring you the best selection of high quality, one of kind African Inspired pieces the industry has to offer. At Zuvaa, We’re Shining A Light On African Fashion. The Zuvaa Marketplace Is A Premier Online Destination To Find Unique And One Of Kind African Inspired Pieces. We Work Directly With Emerging Designers Around The World To Bring You The Best Selection Of High Quality, One Of Kind African Inspired Pieces The Industry Has To Offer. 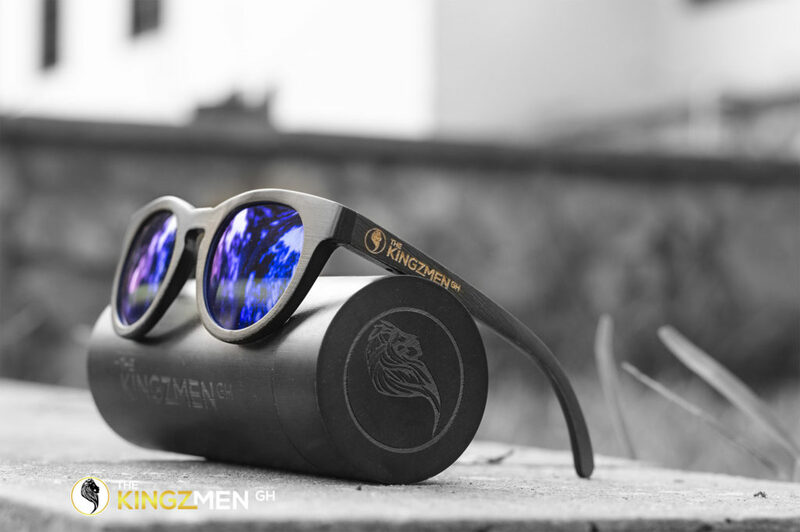 The KinzmenGh is a sunglasses business that has been created by one of our innovative return volunteers, Abel Ofoe-Osabutey. Driven to make a difference by his younger sister’s sight problems, Abel has built a Bamboo Eyewear Business to help prevent blindness. Abel’s experience with Challenges Worldwide connected him to those with relevant design expertise to support him in his entrepreneurial endeavours. Return volunteer, Jack Fellows, has founded The Social Mercenary since finishing his Challenges Worldwide ICS placement in Ghana. 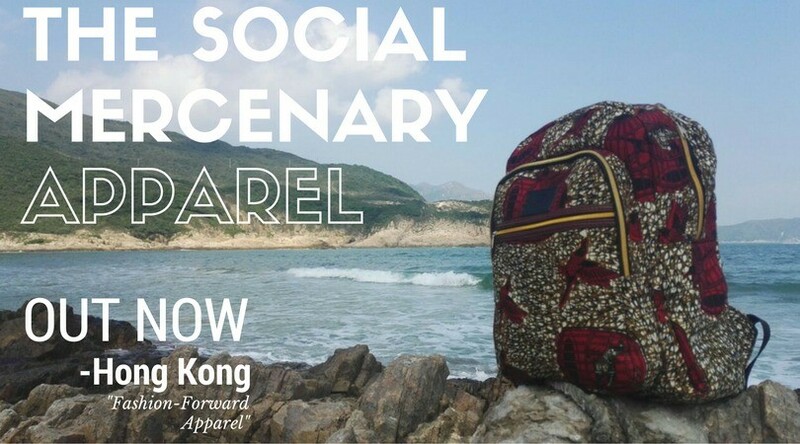 Now working in Hong Kong, Jack’s platform provides entrepreneurs from the developing world the opportunity to market their products to a global audience. 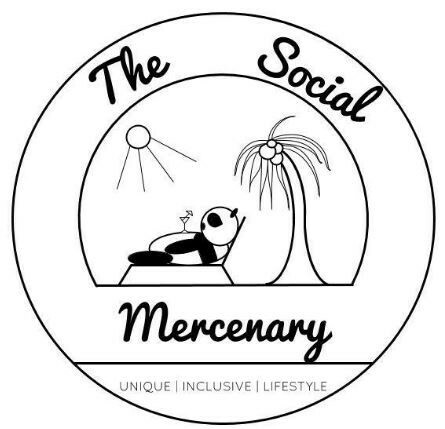 In the long term, Jack hopes to invest in the businesses promoted through Social Mercenary to further their successes. 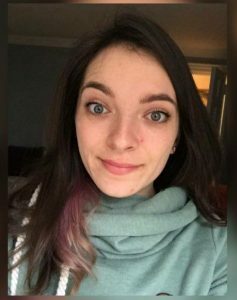 ‘Challenges Worldwide give you a great deal of responsibility during your placement and so not only did I develop skills in market research, I also gained a great understanding of the operating procedures and the financial recording requirements that are vital to a business. Finally, and probably most importantly, the placement gave me confidence in my own ability’. 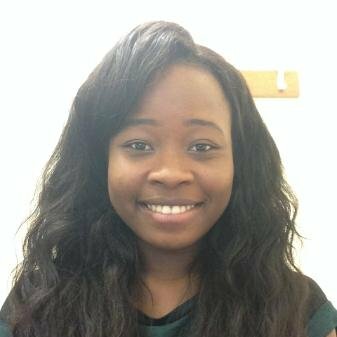 Following her Challenges Worldwide ICS placement in Zambia, Nifemi Oyebanji, has gone on to set up the Lagos Fashion Festival in Nigeria. Motivated by the vision to bring together young people and professionals within the fashion industry, Nifemi helps connect people from across the industry to showcase their work. Through workshops, talks and large scale fashion events, Nifemi is redefining a sense of pride in ‘Made in Nigeria’ apparel and encouraging young people to consider career routes into the sector. A percentage of ticket sales from Lagos Fashion Week also goes towards supporting mental health programmes in Nigeria. I started by purchasing 40 tote bags from eBay and then asked creative contacts for advice about producing images to print onto them. After seeking advice on ink printing and a talented friend kindly agreed to create some Ugandan animal illustrations, I purchased some carve rubber for handmade block prints and decided to use only the colours of the Ugandan flag – black, yellow and red – and letters from the word ‘Uganda’. 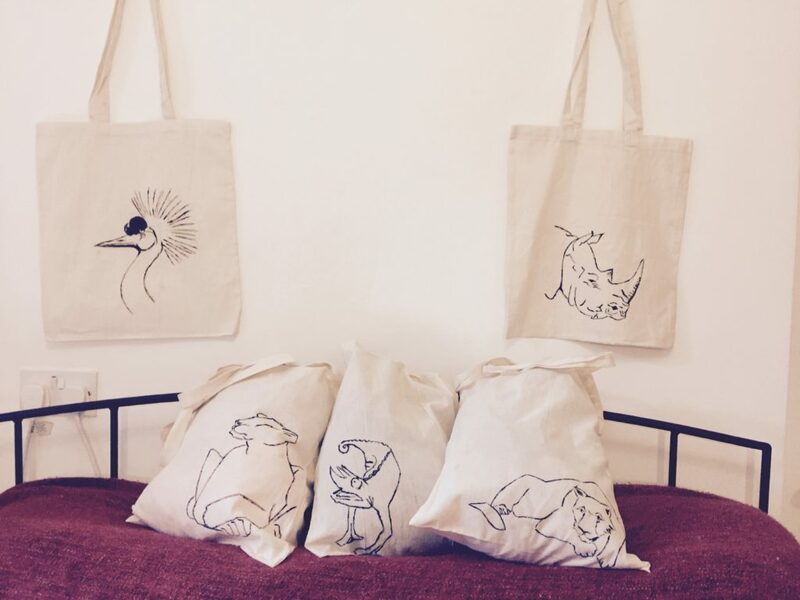 With some help from YouTube and an evening with a couple of friends who helped me print in exchange for food and wine, I finished hand-printing the bags, each with a bespoke design. 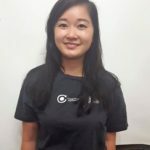 I documented my progress on a blog in the hope it would inspire more donations as people could see the research and work that went into each stage. It was kind of spontaneous, I had a lot of colourful string at home that was just collecting dust so I figured I’d try and make something out of it. The inspiration came from seeing photographs of some bracelet ideas on Pinterest. As you can see, Challenges work covers the entire spectrum of fashion and textiles. 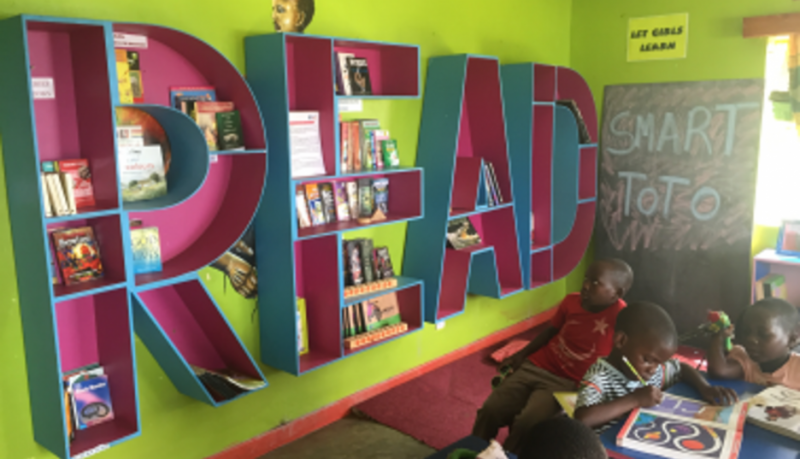 Our programme allows volunteers to utilise their creativity – whether that be through their fundraising before placement, their direct work to support African SME’s or during their work after placement. We are constantly inspired by the amazing work of the people and enterprise that we have had the pleasure of working with. We hope this blog has inspired you. Isn’t it time we started talking about prosperity not poverty in relation to Africa? 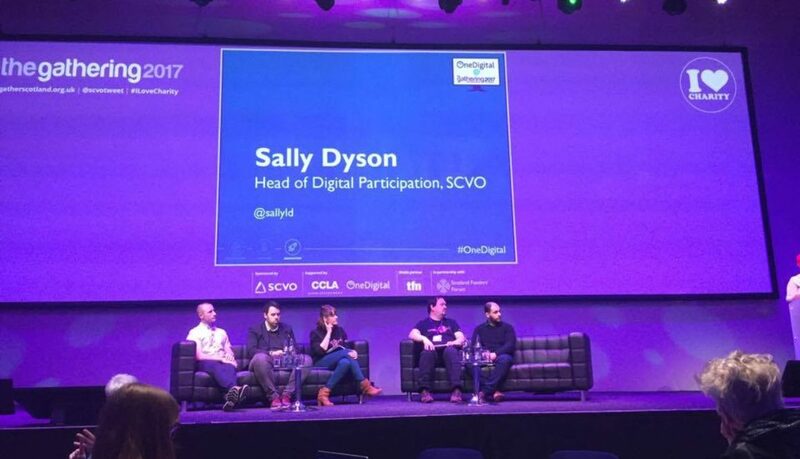 As Challenges Enterprise Portfolio Director, I was delighted to be invited to present and join a panel discussion as part of SCVO’s The Gathering 2017 in Glasgow last week to talk about how Challenges are showcasing innovation and tech for good. In our case the emphasis on prosperity and the leapfrogging opportunity that we believe technology can play in growing African economies such as Ghana, Uganda, Zambia and Rwanda where I oversee a growing portfolio of SME’s. The Gathering is the only event of its kind in Scotland. It’s a unique opportunity for people in the third sector to meet, connect and share ideas. It’s also a great way to form new partnerships and learn from a wide range of colleagues. Since 2014 it has attracted 38,148visitors, brought together 1,452 exhibitors and delivered 548 workshop events. It was exciting to talk to a room of engaged people about the potential for the African SMEs and future leaders we support through our programming. 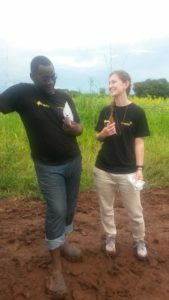 Having spent the night before being bombarded with the lazy shock marketing techniques of unnamed NGOs asking for my money in relation to the famine in South Sudan, it was a perfect opportunity to challenge the common perceptions about Africa. Since 1999, Challenges has taken an innovative approach to Enterprise development working in 40 countries around the world. This has lead to us now embracing technology fully across our enterprise and professional development work. Since 2014, we have been able to bring +300 SME into a cloud-based performance platform allowing enterprises to track and share KPIs to access trade and finance markets…. Enjoy the video! I start at 30 mins! Watch this space for even more technology developments at Challenges and our markets but most importantly, sharing success stories. Throughout the years, we’ve been told that on Valentine’s Day we have to give our loved one’s chocolates, flowers, teddy bears or a surprise dinner. However, let’s just stop for a second and think about the environmental and social consequences that this massively commercialised day brings with it. To be honest, I’ve never given it a thought, until a few days ago I started to look for information to write about Valentine’s Day. And the information can be a wee bit overwhelming. Around the 14th of February, the consumption of chocolates, flowers and cards increases worldwide. 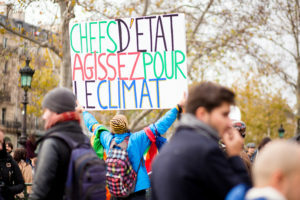 The first thought tends to be that we’re stimulating the economy, but more than that, we’re participating in practices that aren’t sustainable for the environment and enhances human exploitation. So, let’s look at some of the activities or materials that go in to making this special day that comes about oh but one a year. 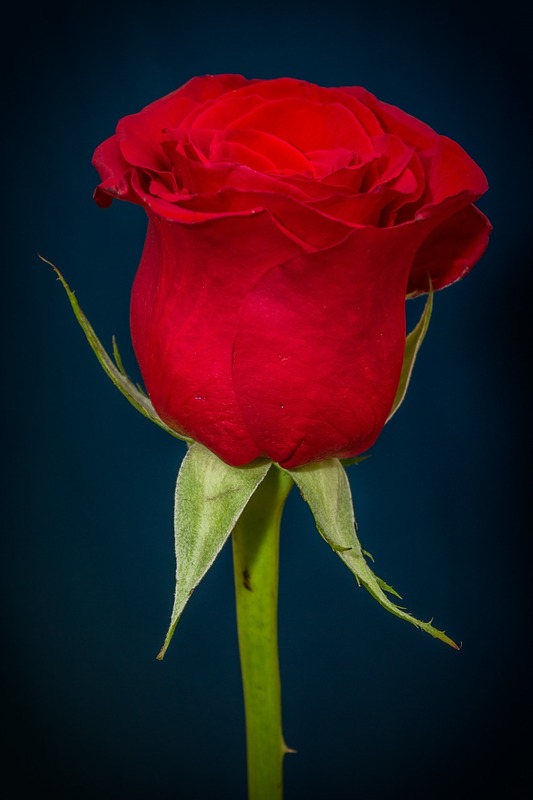 Given that red roses and love are totally interconnected, an industry scale production is needed to satisfy the world’s demand for brightly coloured rose petals. 83% of the cut flowers are from the Netherlands, Ecuador, Colombia, Ethiopia and Kenya. 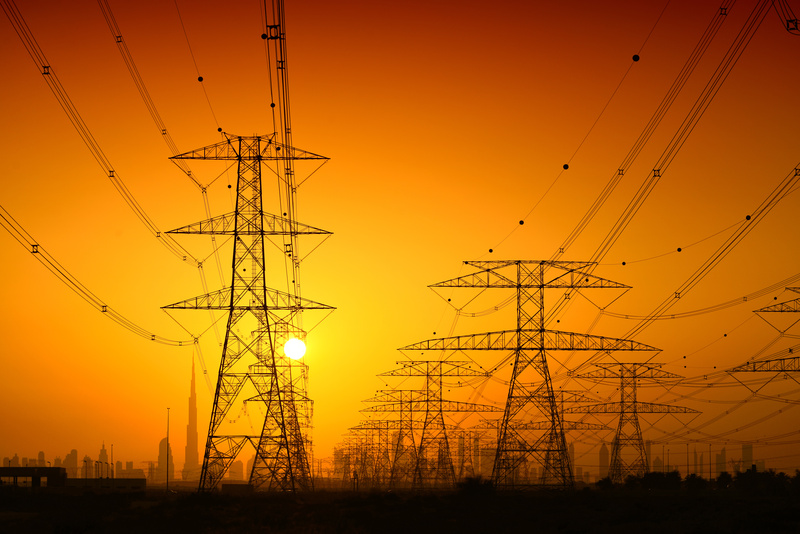 Although there are certain controls, the environmental impact of this industry can’t be ignored. The first one that comes to mind is the chemical pollution, which deteriorates the soil, destroys air quality and poisons the water supply. Also, the carbon footprint related to this production is quite impressive. Only the Netherlands generates 35 thousand kilogrammes of carbon dioxide by growing 12 thousand long-stemmed roses. In several regions, the massive production of flowers can cause more damage to the community than economic benefits. Some of the current main issues are the access to water for this type of plantations. Kenya, for example, needs to import water in order to be able to maintain both, flowers and food crops. Similarly, competition for land use may affect food security, not only in the country where the production occurs but also in all the countries where they export their production. Also, this high flowers demand has led to exploitation in some countries. Colombia is the second largest exporter of flowers in the world. However, many of the floriculture companies don’t respect the rights of their workers, making them work up to 20 hours a day, with almost no breaks and very poor working conditions. According to Hallmark, 141 millions of greeting cards are bought ahead of Valentine’s Day. unsurprisingly, most of them will end up in a bin, which leads to more wasted energy and pollution, even if they are recycled. Why not get creative and make your own? It is much more heartfelt! In 2013, it was reported that 40% of the cacao used by the chocolate industry comes from plantations in Western Africa, where child labour is still occurring. You can avoid this pitfall by buying fairtrade and checking the supply chain of any products you consume. Although not a romantic staple, the same advice goes for coffee! I know, it’s overwhelming, and the solution to many of these problems seem to be beyond our scope. The solution isn’t to stop celebrating Valentine’s Day, we can have a huge impact by just making wise choices when it comes to buying our gifts. We can start giving flower pots, for example, which won’t die in a few days, or you can buy ethically sourced and sustainable cosmetics. But if you, or your lover, love flowers, think about buying locally produced or fair trade ones. Same with chocolates. 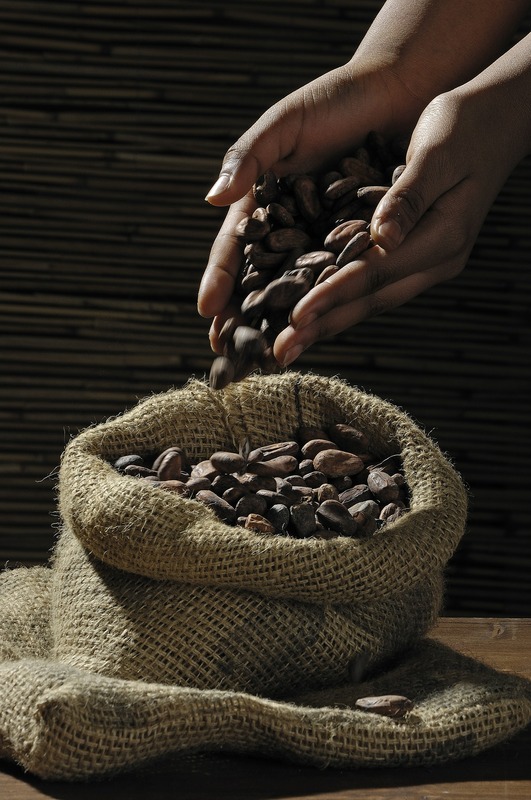 Every day there are more and more brands that buy cacao from socially responsible companies in many countries in the Global South. Finally, this day, at the end, is all about sharing time with your partner. So one of the best gifts you can give are homemade dinner, watching movies together or just walking in the park. In other words, your time. Celebrating Valentine’s Day In Africa! Life is not all about work and business. Leisure, celebrations, time for ourselves, are all needed for a happier life. That’s why today, on Valentine’s Day, we’re neither talking about outstanding business in Africa nor what can you do to improve them, but about how they celebrate the lover’s day across the world’s largest continent. The truth is that it’s probable that many of us have never give it a thought. We might have taken for granted the flowers, chocolates, teddy bears and romantic dinners to celebrate it because that’s what we’re used to in most of the UK. But, it happens to be, that it’s not like that. Different cultures and countries have their own way to commemorate the love that couples share. That’s easy to figure out. 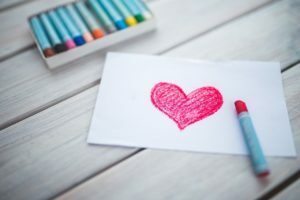 On the internet, you’ll find loads of articles that will tell you stories about how the tradition loterie d’amour (drawing for love) was banned in France or how in Philippines mass weddings ceremonies have become very popular during Valentine’s Day. Also, about how in Denmark women can receive funny poems or why Wales or Brazil celebrate this day on January and June respectively. However, besides the South African way to let men know their secret admirers, there is not much information about how other African countries celebrate Valentine’s Day, or even if they even celebrate it or not. That’s why we decided to ask our team in Ghana, Uganda, Zambia and Rwanda about their traditions on this date. 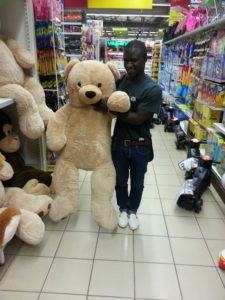 Happ ens to be that in this country Valentine’s Day is massively celebrated. Actually it is one of the most celebrated feasts, just surpassed by the Christian festivities of Christmas and Easter. The emphasis is on couple love, where ladies measure if they are really the #1 for their partner (if they’re not asked out, the inquiries start. So maybe better not to take that risk). Dressing red or giving flowers are not part of the tradition. As you might expect there is a boost in the sale of contraceptives around this time. In this country, this celebration does not follow a special African way. Going out for movie nights or dinner, as well as enjoying the special offers that business make for this day are very common activities among young couples. Also, to keep the meaning and substance of this day, the exchange of gifts between lovers cannot be ignored. Here we continue with the western influence, so they celebrate in a very similar way to the UK. In this sense, Ugandans buy their loved ones’ flowers and/or chocolates, or they can also go out for a nice meal. Valentine’s promotions are all over the place, from shops to hotels and restaurants that want to be part of this celebration. Also, the red and black colours are important when dressing, especially in Kampala, just to mark the day. Some people make a big deal about Valentine’s Day, some others don’t. However, shops, restaurants and streets accompany those who like to celebrate it with red, white and black decoration items. Like the others countries we’ve talked about, big sales and dinners are an important part of this celebration. However, if you don’t have a partner you don’t have to celebrate alone because affection is not only for couples. That’s why in Zambia is also common that friends and family get together to show affection to each other. Valentine’s Day in many African countries does not differ that much from what we’re used to. It is being celebrated more and more every year. This could be a sign of globalisation and the increased exposure of young people to this western festival. As more people celebrate, of course consumption goes up. So it doesn’t matter on which continent you are, the environmental impacts that this celebration has are the same. 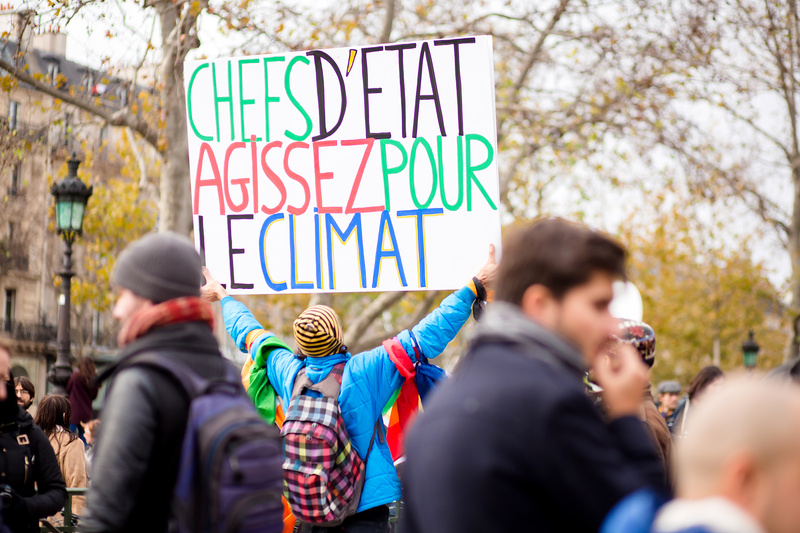 That’s why now we invite you to read and learn about how to celebrate the lovers’ day in a sustainable way.